We are here again with new and exciting news for you. We just connected 21.com to our platform – and they bring some amazing deals for you to work with. The players you direct to the landingpage will get the feeling of how easy and userfriendly a Casino can be. We think simplicity is the key here! Spudo’s Managing director René Sørensen said: 21.com is keeping the design tight – so that the customers get the best experience when signing up. We believe that the amount of bonuses will have a positive effect on the long-term players. I mean 21 spins for 21 days is a pretty awesome way to welcome your players. Our publishers will be able to access these offers on CPA and CPL in Canada, New Zealand, Sweden, Norway, and Finland. In addition, SPUDO publishers can request custom made marketing creatives, such as custom made landing pages, email, SMS & banner creatives that fit their traffic source. This will be provided for the publisher within 48 hours. 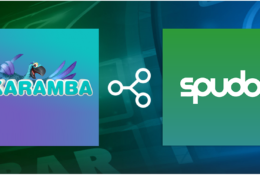 Today the mood is high here at Spudo, because we are connecting Gunsbet Casino to our platform. Watch out for the lion. LeoVegas is live now! Leovegas is a well established brand in the Nordic markets. We are super excited to let you know that they are live on our platform. We are very excited to inform you that we connected Lanadas to our platform. Lanadas caught our attention here at Spudo, with it’s way of making us feel like we are part of a western, when entering the casino. Karamba will be our first brand we connect to our platform where we do not build our own high performing marketing content too.